2007 U.S. Open: Simutowe leads with 5-0! 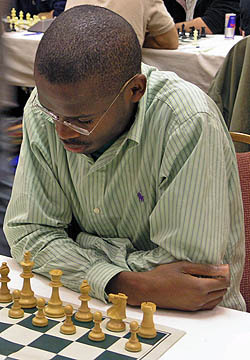 After five rounds of play at the U.S. Open, Zambian International Master Amon Simutowe is in the lead with an unblemished 5-0 score. While he has not faced the toughest competition, he has been able to cruise thus far. After six rounds, the fields will merge and the top players will begin to battle for high stakes. To win the U.S. Open would be quite a lift for the 25-year old Zambian who is attempting to gain momentum for his 3rd and final norm. In other news, Hikaru Nakamara and Alexander Shabalov will play four rounds today and hope to come out with top scores. The two are the top seeds and before the day is out, will play each other… hopefully not in the 60-minute time control! There are approximately 400 players (four schedules) at the U.S. Open, the 108th edition. Monroi is providing live coverage and Jennifer Shahade is filing reports at uschess.org. Coverage and blogging available at The Chess Drum.